So packed full of trailers is this year's E3 that they've exploded out across both time and space. Here, six days before the event's start, is the official E3 video of Sword Coast Legend. 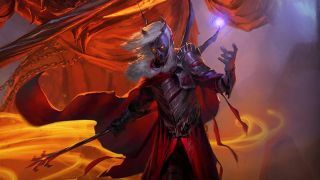 Using the Forgotten Realms setting, Sword Coast Legends is a Baldur's Gate/Neverwinter Nights-style old-school RPG being headed up by the director of Dragon Age: Origins. In addition to the campaign, a dungeon master mode will let one player create a dungeon for a party of co-op heroes—placing down enemies, traps and directly controlling bosses. It all sounds pretty promising, even despite the line "Necromancer with a heart of gold". Sword Coast Legends is due out September 8.